Former Nova Scotia cabinet minister Russell MacKinnon stopped testifying at his trial on Friday and pleaded guilty to breach of trust for his role in the province's spending scandal. MacKinnon entered the plea on the fourth day of his trial at the Nova Scotia Supreme Court in Halifax. The former Liberal was expected to resume testimony on Friday but the judge overseeing the case granted a temporary adjournment at the request of his defence lawyer. When the case resumed, MacKinnon changed his plea. Judge Felix Cacchione sentenced MacKinnon to an eight-month conditional sentence that includes four months of house arrest and four months with a 9 p.m. to 6 a.m. curfew. After that he'll be on probation for a year. MacKinnon was one of four politicians charged in February 2011 following an investigation by Nova Scotia's auditor general into constituency allowance spending. He was the first to contest the charges — two of the three other politicians charged have been sentenced. 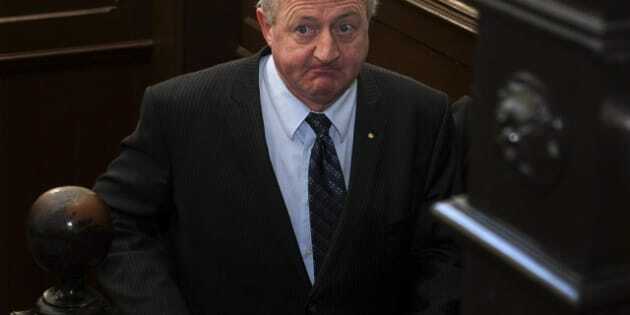 Former Liberal Dave Wilson was sentenced last April after admitting to defrauding the public purse of nearly $61,000. He was released from custody in August after serving four months of a nine-month sentence. Richard Hurlburt, a former Progressive Conservative cabinet minister, was sentenced last July to a year of house arrest after pleading guilty to charges of fraud and breach of trust. Independent member Trevor Zinck — the only sitting member among those charged — is charged with theft over $5,000, fraud over $5,000 and breach of trust. He is to go to trial in June.